One of the best foods to keep on hand: meatballs. 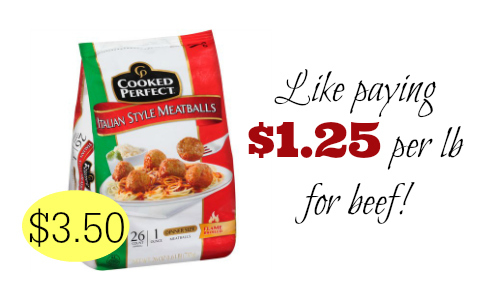 They are perfect for easy meals, so stock you freezer with this new Cooked Perfect Meatballs Coupon. They work great for spaghetti, meatball subs, or stick a toothpick in it and call it an appetizer. They will be on sale at Publix starting 3/18 or 3/19, making a bag $3.50! That is like paying $1.25 per lb for meat!! Deal runs 3/18-3/24 or 3/19-3/25 (depending on your area).